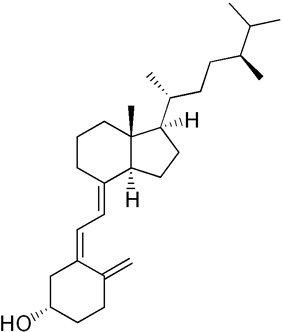 22-Dihydroergocalciferol is a form of vitamin D, also known as vitamin D4. It has the systematic name (5Z,7E)-(3S)-9,10-seco-5,7,10(19)-ergostatrien-3-ol. Vitamin D4 is found in certain mushrooms. ^ Phillips KM, Horst RL, Koszewski NJ, Simon RR (2012). "Vitamin d(4) in mushrooms.". PLoS ONE 7 (8): e40702.